You will need to be logged into MySpace. Log in or sign up for MySpace. 2.Enter your imeem e-mail address. 3.Click import and we will retrieve your playlists. How do I import my imeem playlists? Rest assured, your playlist and user data are safe. 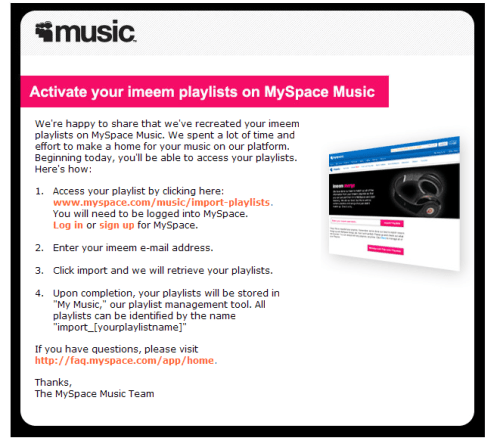 The MySpace Music team has recreated your imeem playlists on MySpace Music, and you can now access them from your MySpace account.